New Norfolk NEWS: Big new fire truck - with foam on top! Brigade's new heavy tanker at Cambridge yesterday. 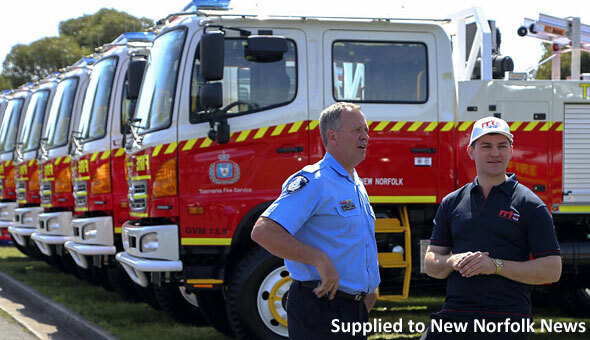 THE New Norfolk Fire Brigade has been allocated a brand new heavy tanker that will give our local firefighters greater capacity to fight bushfires this season. Thanks to a church group's donation, the tanker has also been fitted with a world-class foam firefighting system. Fourteen new heavy tankers were unveiled at the Tasmania Fire Service (TFS) engineering section at Cambridge yesterday morning. The $3.5 million fleet was developed in-house by the TFS. "These new tankers represent the latest capital investment in the frontline of our fire service, and will soon enter service with brigades around the state," Police and Emergency Services Minister Rene Hidding said. "The new tankers are fitted with Compressed Air Foam Systems (CAFS), which enhance firefighters’ ability to suppress fire," Mr Hidding said. "A generous donation of $166,000 from the not-for-profit organisation the Rapid Response Team has supported the TFS in fitting CAFS to six of the tankers, which are being allocated to brigades in communities touched by the 2013 fires." Firefighters demonstrate the foam firefighting system. The donation funded the fitting of the revolutionary foam system on the heavy tankers being allocated to the New Norfolk, Dunalley, Bicheno, Dodges Ferry, Nubeena and Bagdad fire brigades. 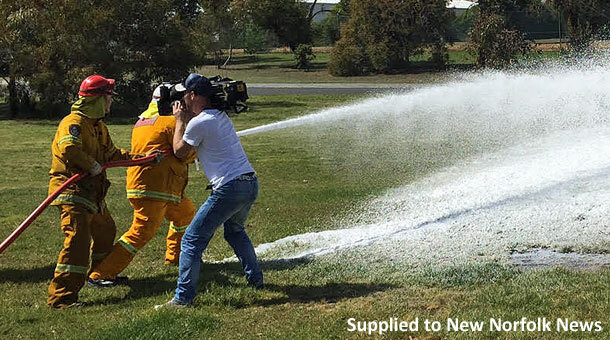 CAFS uses significantly less water to produce foam concentrate for firefighting suppression. Rapid Relief Team (RRT) spokesman Jurgen Vos said the organisation had worked for two years to raise the donation after many of its members experienced first-hand the 2013 bushfires at Dunalley and Molesworth. “The RRT volunteers provided catering services to TFS crews fighting those fires and were inspired by their bravery and commitment,” Mr Vos said. “We saw how stretched those TFS crews were and wanted to ensure that the next time they faced a similar emergency they were better equipped to protect Tasmanians.” Mr Vos said the RRT membership was drawn from the Plymouth Brethren Christian Church. The RRT sent out an appeal to the Plymouth Brethren community in Tasmania and interstate and was overwhelmed by the generosity received. Mr Hidding said the commissioning of the new tankers – complete with the latest safety features – will further strengthen the state’s response to bushfires. The CAFS system coupled with an Active Vehicle Location system would improve both the effectiveness and the safety of our firefighters.